Because I'm totally a nerd mom I had to take a picture of some of the packets, aka theme units I developed for K to work thru this last year-2nd grade (as I'm clearing out the clutter). I am such a sucker for theme units so I'd scour the internet for crafts, projects and printables and put it all together. It never seems like much is accomplished in the moment and I always feel like we could or should be doing more, more, more. Now that I look at these though...wow! Pretty cool. Some are missing for who knows what reason...lost, crumpled, left in the car and inevitably, tossed. Gasp! Which is where these are headed. In the recycling bin of course! Of course I found a couple that were left more unfinished than finished to include in this picture. Haha! We'll finish them up this summer. Think I wouldn't!?! I choose a theme, which usually matches the current weather, season, or holiday of the month. It's super easy to find printables (mostly free) for every subject on every topic. Hello Pinterest!?! 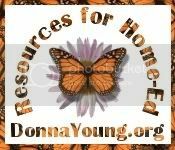 I personally have a few fav sites that I use regularly Education.com (some printables are free but I have full access with a subscription from our charter school) and Readworks.org (for language arts passages). Those two links usually make up my base. From there I search for themed math worksheets. He has a math book so those would be supplementary and colorful! I use multi-media like youtube to find interesting videos to match the theme. I can incorporate language arts, math, science, social studies and/or history and even fine art. Science is often my starting point or subject because language arts can be incorporated with anything. Occasionally I will create a packet that focuses solely on language arts skills using reading passages, graphic organizers, writing prompts and reading comprehension such as a Fairy Tale packet I created. Or one that had beautiful, full-color graphic organizers that was all about writing good sentences and solid paragraphs with a main idea and supporting sentences. I use science topics the most though because helllooo...experiments! When I shared in class that I prefer to use theme units, my professor responded that it is hard and takes years of experience to create theme units. I don't know if that is true or not since I DO have years (19 so far!) of experience. I certainly don't think it is hard though. If I may be honest, I love theme units because it feels so easy. 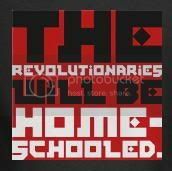 Like the lazy mom's way to home-educate! Why not use one topic and hit all the subjects instead of having 6 separate subjects AND topics? Over all, I can say, now that it's summer, that we had a great year. I was doubtful at times. Scared often. Home-educating is a huge responsibility. My darlings aren't always as excited about it as I am! I don't know why. ;-) We also did a lot of organic learning...while hiking, visiting nature centers and various outdoor environments in different seasons and all kinds of weather. There you have it folks...the lazy mom's guide too homeschool. Maybe that should have been the title? Our first "science experiment" of the year! 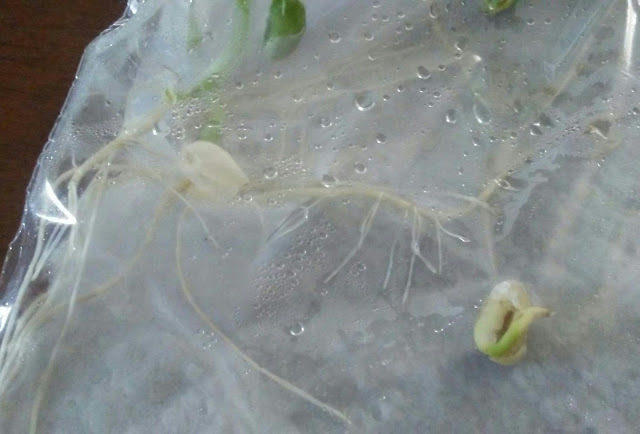 Simple seeds and sprouts. 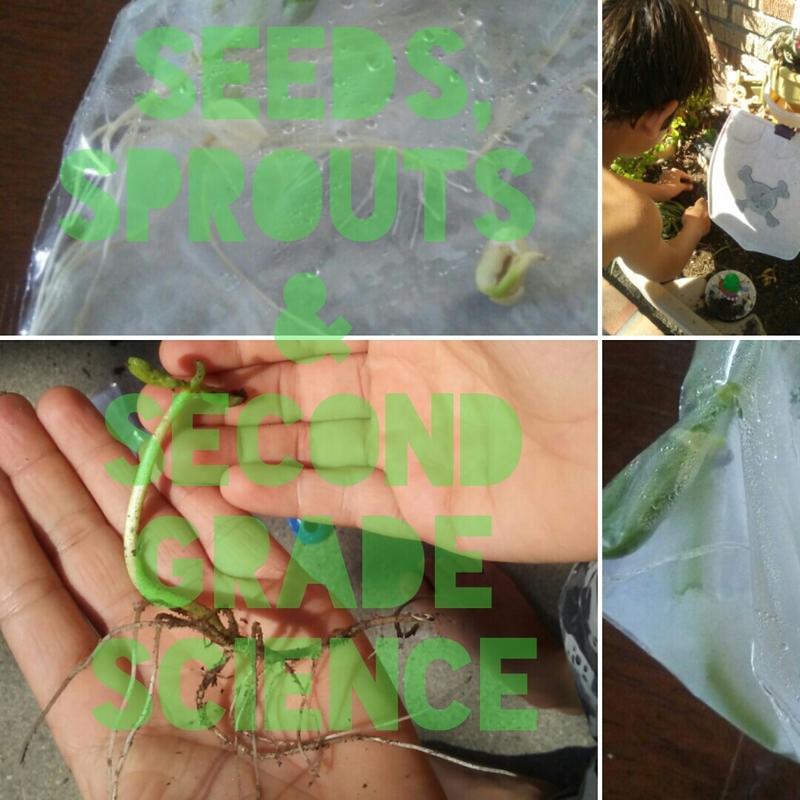 Second grade science is very similar to first grade science. The first chapter of his science workbook include information about plants and the life cycle of a seed, parts of the male and female plants etc. There was an experiment, that he skipped many lessons to get right to. 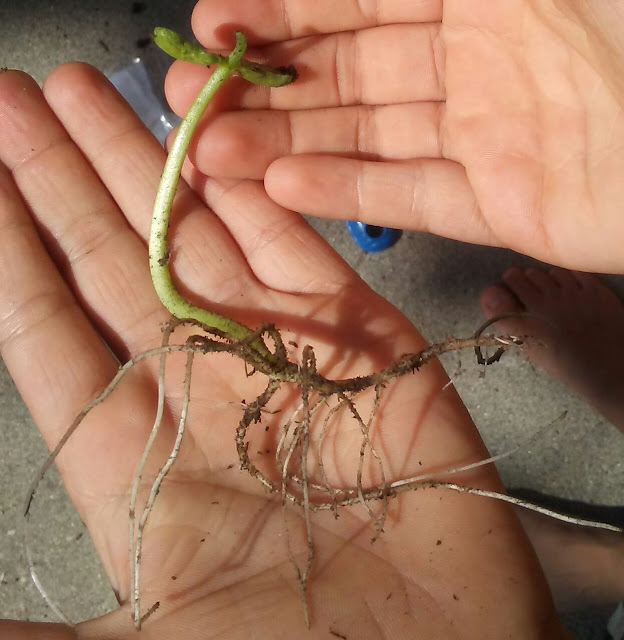 Navy bean sprout with long, strong roots, ready to plant. Kurtis wanted to follow the experiment exactly, which instructed placing the seeds with a damp towel on a tray. I knew they would dry out, (regardless of how many times I refilled it with water!) 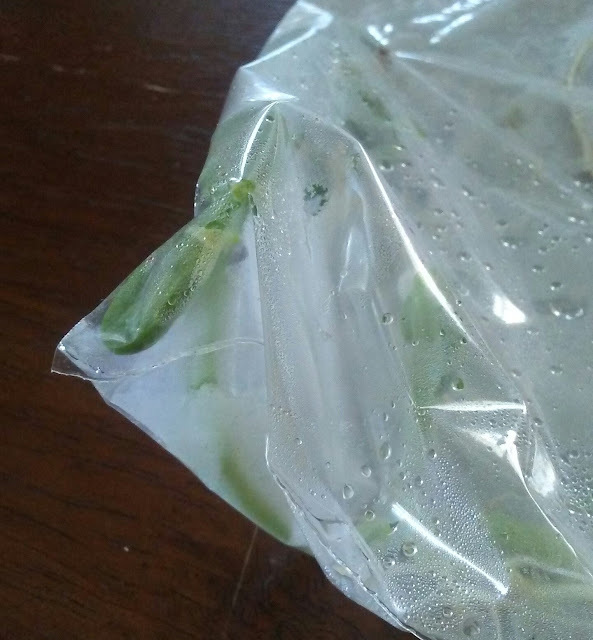 and suggested placing the seeds in a plastic ziploc bag instead. He did not believe me, of course! In the name of science, we did both, to prove which method was best. We used what we had on hand...sunflower and chia seeds, and white navy beans. The seeds in the bag did splendid. After only a few days there were sprouts and roots. One seed on the tray sprouted but the paper towel dried out daily. It wasn't long before the seeds in the plastic baggie, were ready to plant. 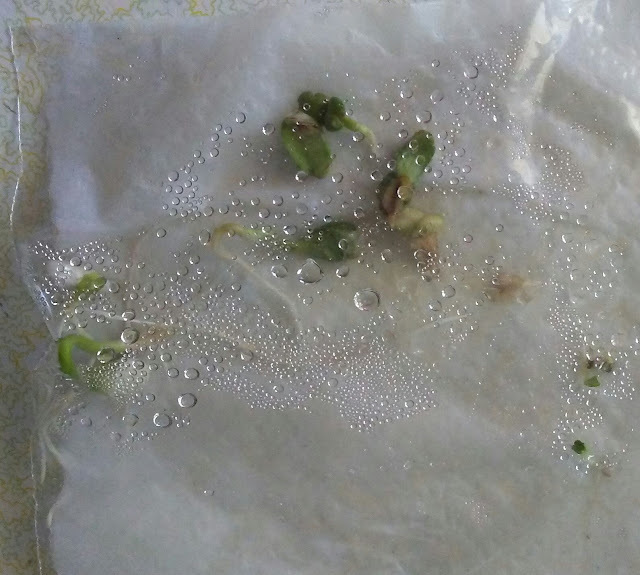 This is a picture of our first sprouts. 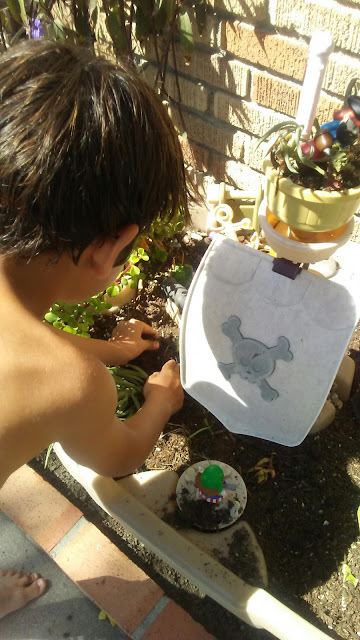 Today he took the white navy bean sprouts, which had the longest roots and planted them into his pirate garden. I hope they continue to grow well. After this, (and after digging through everything to find his 'nature journal' that had mysteriously gone missing) he drew sketches of the sprouts and roots, then sat in the back yard for some observation time of the garden, sketching his observations into his journal...which included an explosive bomb? I don't know, guys...seven year olds! I just don't know. He promptly erased it when I reminded him that I didn't believe he witnessed a bomb in the back yard. I think science used to be a challenge for me? I can't really remember but it's certainly not now. I love it and everything about it. It's so exciting and I love over-lapping into other subject areas, covering the full spectrum of S.T.E.A.M! Into the garden they go! I wrote a similar post last year...declaring it year 17 and I was totally wrong. Don't hold it against me that I did basic math wrong. Samuel is now in 11th grade, Bird in 9th and Kurtis bringing up the rear (kicking and screaming, literally) in second grade this year. It's been a wild ride but over all, I am happy with how I have endured and what we have accomplished. Especially when I really had to start flying solo. I have continued on this path of home-educating because I really believe it is the best form of education over all and the best way for my children and our family. It has cost us, as all good things do. It's interesting to watch the middles interests develop and their skill grow. Both are continuing to take art as an elective. Samuel is pursuing dance more seriously. Liberty, starting highschool, is taking a-g courses, which is a college preparatory path to graduation. She says she is going to take a break from the theater program, at least on-stage but I sincerely hope she changes her mind. In the end, it will always be her choice. Kurtis, sigh, is still Kurtis. Haha. He's enjoying every aspect of life to the fullest. It's always been a challenge to get him to sit down, but that is ok. I am not above bribery and other methods of encouraging him to cooperate. He is very bright and picks up concepts quickly so after hours of fighting with him to do a page of book work--he can finish it in three minutes flat. True story! We had a terrific summer. Really full with lots of outdoor time. I plan to continue our weekly hikes. Middles will have their evening classes and their Tuesday writing class...so far that is it. Which is more than enough and enough to keep this momma hopping and dependent on my phone calendar! It's the beginning of a brand new year and we usually start strong. I hope we can maintain momentum, not too fast and not too slow. A girl can dream! I don't have any great vision or expectation for this school year yet. I don't even know if I should and if this is a bad thing or not. After last week's art-scapades, I decided to continue our art education. The middle and highschooler both take a weekly art class but the first grader isn't this year. 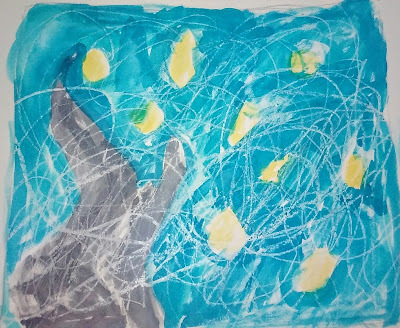 On the right of the pic is my middle schooler's interpretation and recreation of Starry Night. On the upper left is the first grader's original relief painting in the works. It was very simple. First, I searched Pinterest for inspiration. Then I found a few very short videos on the work of Van Gogh on youtube. 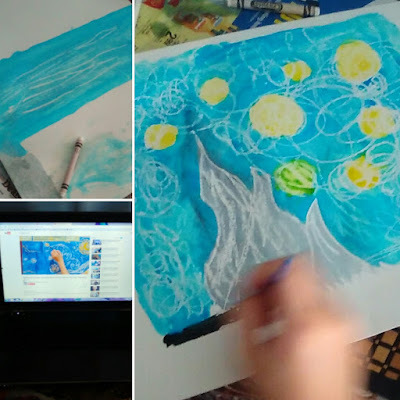 The first grader watched the video then I allowed him to recreate one of Van Gogh's works and create his own using an easy relief method. Draw on art paper any design with a white crayon. Using water color paints, paint over your hidden design. The crayon will produce blank spaces under the water color as a relief painting. This was his final piece, an interpretation of Van Gogh's Starry Night. I also printed out a free (found online) Van Gogh coloring page and he wrote a couple sentences of facts he learned about the artist underneath. Above is the version I did with a student at work. I made all the water color marker lines and also crayon lines in white (that you can't see) and in black for the building. She used a wet paint brush to blend the colors together. We work on a lot of fine motor skills together during her sessions. This also entails learning and moving the paint brush from left to right and up and down. It's been a rough few months due to the move and adjusting to all of that, so I have been off my home-educating game a bit. Haha. I love pinterest for inspiring ideas! 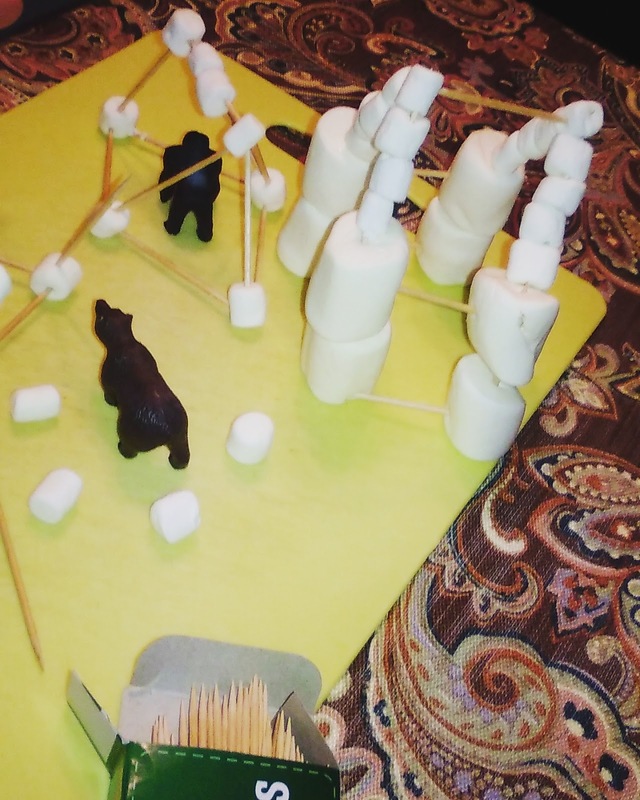 I found various activities using marshmallows and tooth picks. I knew there were STEM challenges to do but I wanted more creative exercises. Sometimes all you need is one suggestion to spark your own ideas. The middle schooler could not help joining in when she saw the first grader starting his structure. Building a structure with tooth picks and marshmallows. The initial challenge was to create animal dens from the supplies given. Once that was completed, I upped the ante by challenging my students to create the tallest, free standing structure possible. It needed to be sound enough to maintain it's height with out falling over. It's more challenging then it sounds. 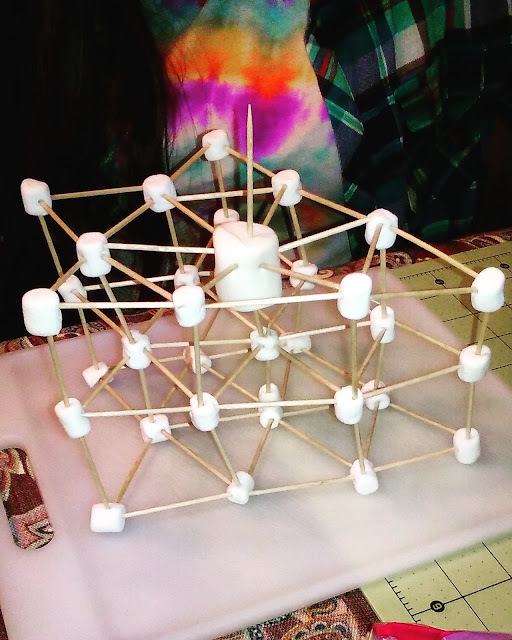 They enjoyed this and it covered all STEM areas: science, technology, engineering and math. Supposedly, right? haha. They definitely experienced and learned about the force of gravity. 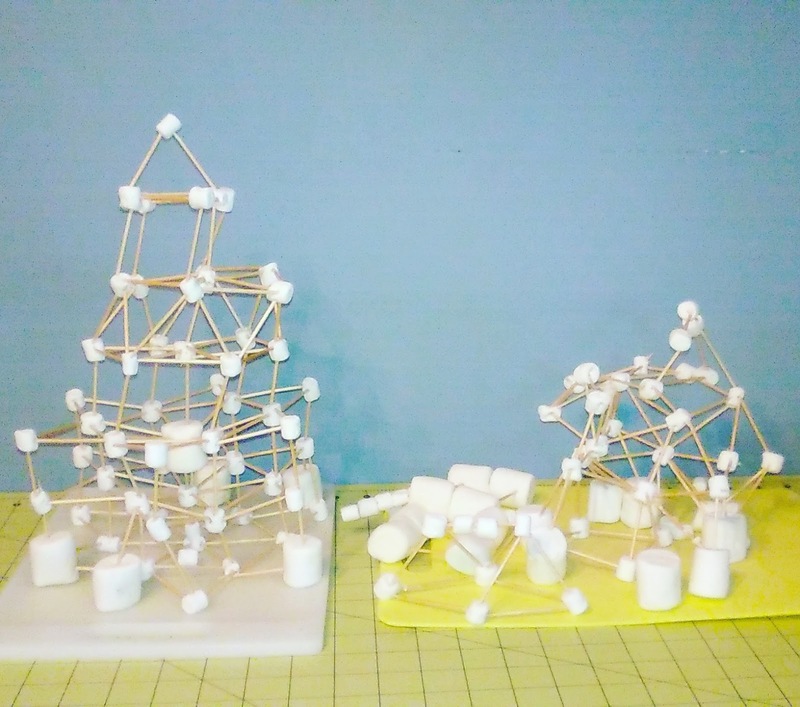 Can you guess which structure was created by the middle schooler and which was created by the high schooler & first grader team? I subscribed to a few inspiring and informative home-educating blogs. 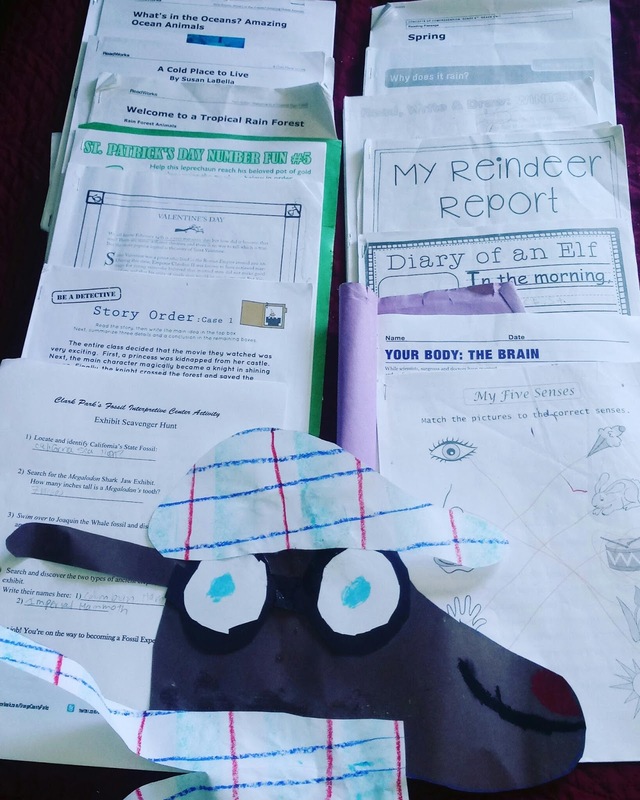 The various blogs are a great resource to free printables, activities and ideas for all sortts of subjects. Recently one suggested a Valentined theme fine art unit. Easy peasy! The art piece was using the style of Matisse's cut out art. Using water coor markers, the first grader drew geometric shapes (squares) and colored them in, later going over them with a brush and water to create a little water color effect. He cut out heart shapes from construction paper and glued those on top. Voila! I found printable versions of Henry Matisse's art work for him to color. Youtube has become my new BFF as well. I am amazed at how many great educational videos can be found. I chose a few different but short videos about Matisse and his work. The first grader watched those and then wrote a few biographical sentences about what he learned. We paste all these pieces into a spiral bound notebook (my attempt at organization) to keep them all in one place. This is working well when we have a Learning Record meeting, as I can show our Educational Specialist our portfolio (book) and tear out a page to give her as a sample. The middles high school art class (taught by my oldest son) took a field trip tonight. The class worked on contour drawing. They all walked a block to the local coffee shop, which was packed for the evening, stood around and drew sketches of patrons or whatever else caught their eye. While they were there, various artists did spoken word or performed music. The final act of the night was an awesome indie band that we all thought was really, really good. It was a great way to end my work week and a great way to mix up art class. I am a home-educating mom of 4, flying solo, in the middle of starting over, wanna-be writer, trusting God in this great adventure of life. Lover of nature, tea & baked goods. Grab a cup of tea & stay awhile, won't you? Have a look around & leave me a comment! I LOVE comments.